Two killer toys from Bif Bang Pow! Won't you give Talky Tina and Willie a try? 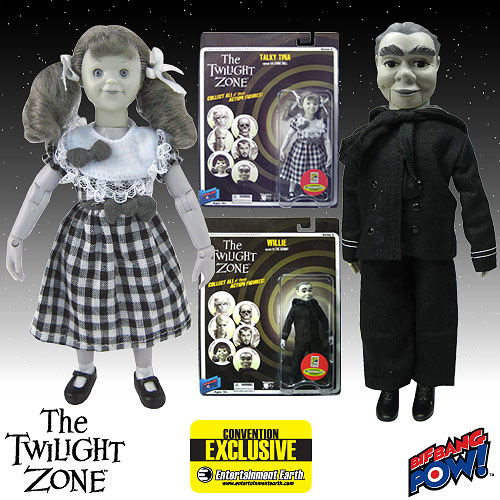 SDCC Exclusive action figures based on the The Twilight Zone TV series! Feature retro, vintage-style sculpting with authentic fabric clothing - on a "child sized" body. Entertainment Earth Comic-Con San Diego 2010 Exclusive! Faithful followers of the iconic The Twilight Zone TV series have reason to rejoice. Bif Bang Pow! brings an astonishing assortment of fully articulated, 6-inch tall action figures to your table. Each extraordinary character features authentic fabric clothing and a retro design that's sure to please fans of the most popular action figures of the 1970s. These black-and-white figures come individually carded in blister packaging. Ages 14 and up. Long before Chucky, there was Talky Tina, star of one of the most spine-chilling episodes of The Twilight Zone ever aired. In the show titled "Living Doll" that also starred Telly Savalas, Tina kept coming back and coming back, no matter what he did to try to destroy her. If you remember that frightening episode, you may think twice before ordering this item. But don't worry. After all, she's only an innocent action figure... or is she? Tina features fabric clothing, multiple points of articulation, and a retro design right out of the 1970s! Based on the ultra-eerie 1962 The Twilight Zone episode titled "The Dummy" that starred Cliff Robertson, this almost-too-real rendering of Willie may make your skin crawl. But no need to feel threatened. He comes in actual fabric clothing and is designed after very popular action figures of the 1970s. Won't you give Willie a try?